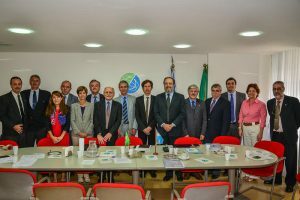 In a meeting held on the 24 April 2013 at ABACC premises, activities were started in connection with two cooperation projects between ABACC and EURATOM. The projects, in which technologies related to containment and surveillance for safeguards will be used, are: – Development and application of a laser 3D LFR system for the verification of physical alterations in the piping and equipment of nuclear facilities; and – Utilization of ultrasonic seals in spent fuel elements stored in locations that are difficult to access. The meeting was attended by the general consul of the Argentine Republic in Rio de Janeiro, Mr. Marcelo Bertoldi, the Secretary of the Embassy of the Argentine Republic, Mr. Maximiliano Alaniz, Counselor João Marcelo Galvão de Queiroz, Head of the Division of Disarmament and Sensitive Technologies of the Brazilian Ministry of Foreign Affairs, and representatives of the Brazilian Nuclear Energy Commission and of the Argentine Nuclear Regulatory Authority. Messrs. Marco Sironi, João Gonçalves and Vitor Sequeira attended as representatives of EURATOM.